Membership is a year-round effort. It never ends. As PTA ambassadors, leaders are to constantly promote the value of PTA, and with it, ignite interest in our mission for people to join in. Our PTA voice is more powerful, and our PTA advocacy is stronger the more members we have. 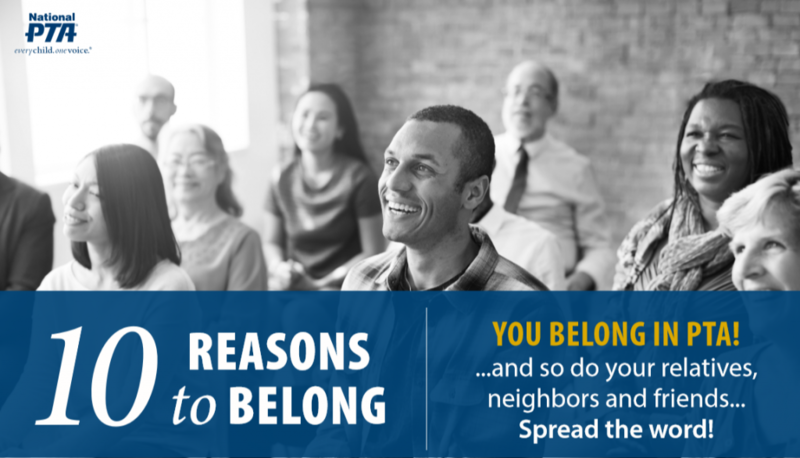 The new year is full of additional opportunities to invite everyone to join PTA this second half of the National PTA membership year (7/1-6/30.) What are those opportunities? To begin with, all of your remaining meetings and activities in your PTA calendar for this year. In March, take advantage of our PTA Family Reading Experience resources available at PTA.org/FRE to celebrate National Reading Month. This is a great opportunity to work with your local librarians to get families (adults and children) to visit their local public libraries, encourage them to sign up to obtain their library cards and borrow books to read at home. In the process, don’t forget to invite all families and community members to support similar PTA efforts by joining your PTA. These are only possible ideas for which multiple resources are already available. In the end, all will depend on what the needs of your students and school community are, as PTA you want to be relevant. 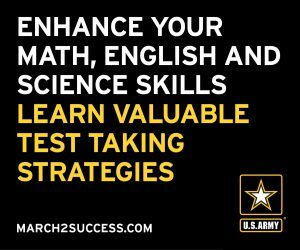 If your families need to be empowered to help their children with test taking, that should be your focus at that time; look at our PTA resources on assessment and coordinate with your school administrators. Making our PTA mission relevant to your students and your community by responding to their needs should be the north that guides the focus of your work. Just remember to always have a way of inviting all to support our PTA work with their PTA membership. And then, share your work with your state congress PTA. They have multiple ways to recognize your membership and mission advancement efforts. So, reach out to them, and share and celebrate your accomplishments with all of us for the benefit of all children. Join the First-Timers Experience at National PTA Convention! Are you a PTA mission believer and achiever? A PTA leader of leaders? An advocate who wants better for our students and schools nationwide? Then we’ll see you at 2018 National PTA Convention & Expo June 21-24 in beautiful and historic New Orleans, La. In true New Orleans hospitality, we will welcome our first-time attendees with extra kindness. 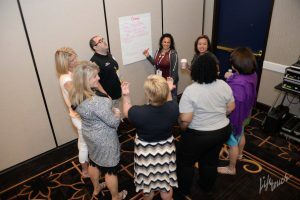 We will show you how to navigate National PTA’s largest and most comprehensive leadership development experience while making the networking easy for you! Come to the First-Timers’ Boot Camp. Join the Convention General Arrangements Committee and other first-time attendees at this must-attend event designed just for you on Thursday, June 22 at 1:15 p.m. in Room 235/236. Walk in knowing who you came with and walk out knowing at least five new friends. You’ll hear about the business, special events and learning experiences at Convention, and then your National PTA First-Timer Friend will help you design a plan for workshops and networking experiences that will match your goals for the weekend. Finally, you will take a tour of important locations like the workshop rooms and General Meetings. 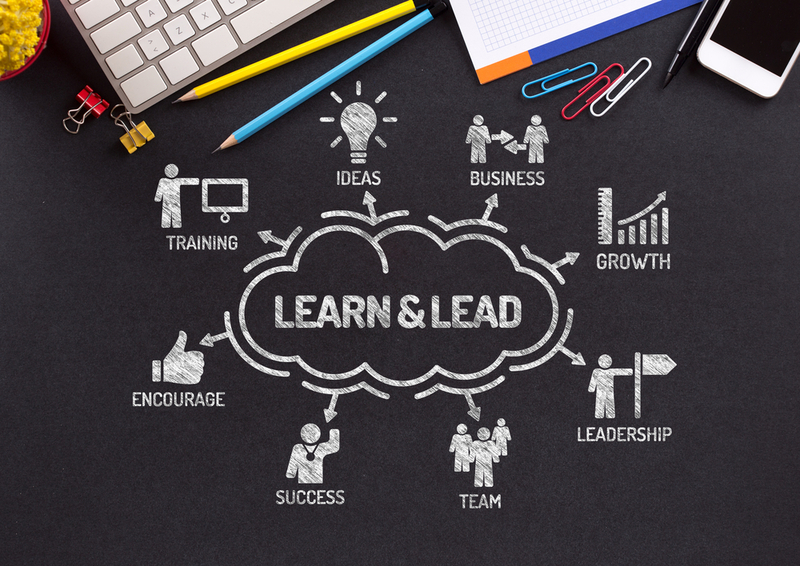 Leave this workshop feeling oriented, confident and connected. Meet back up with your First-Timer Friends for an Expo Hall tour and #PTAProud team-building experience. Your National PTA First-Timer Friend will give you a special invitation to explore an Expo Hall tour designed just for you. 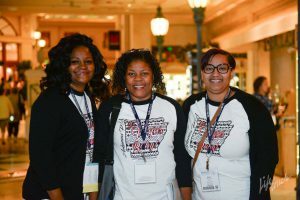 Meet National PTA’s sponsors, connect with National PTA Board Members in the PTA Booth, and then head over for a fun #PTAProud Team-Building Experience. Enjoy a fast-paced icebreaker with your new friends and then take a group selfie at our #PTAProud Wall. Leave this experience with a #PTAProud Recipe for Teamwork that you can take home and facilitate your own PTA team-building experiences! Pack a sweater—even though the average temperature in New Orleans is 90. Trust us. Every Convention Center looks a little different but offers the same chilly relief from blazing summer heat. 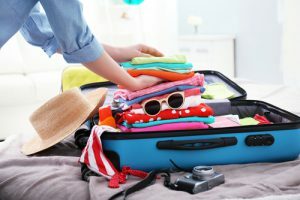 So, bring a sweater or jacket that will help your mind to stay focused on all the possibilities National PTA’s Convention has to offer! If this is your first time at National PTA’s Convention & Expo, get the VIP treatment—join the First-Timers Experience! Didn’t register yet? There’s still time. Visit PTA.org/Convention to register today. Mary Pat King is the director of education and leadership development at National PTA. It’s PTA in Pop Culture Week! Does any of this sound familiar? I bet you’ve heard similar coffee-talk at your PTA meetings or while chatting with other parents. PTA pops up in all sorts of places! A few months ago, National PTA’s Executive Director, Nathan Monell, found a PTA reference in a movie. I mentioned it at a meeting and people quickly began sharing their own “PTA finds.” Before I knew it, I had a monster list of PTA references in movies, music and television shows. And thus, PTA in Pop Culture Week (Dec. 18-Dec. 22) was born. Before we dive into our favorite clips, let’s be clear—most references are not accurate reflections of the Parent Teacher Association. (Can you tell I’m sugar-coating here.) Most dramatizations of nutty bake sales, controlling moms and iron-fisted PTA councils are purely for entertainment purposes. They’re trying to make us laugh. And sometimes, they might even be taking a tiny dig. In the end, we can take it. We’re thick-skinned here. And the PTA can totally roll with the jokes. We love a good laugh too! Let’s begin by going back in time to the “Harper Valley PTA.” It’s probably the most notable PTA reference in Pop Culture because not only does it span a few decades but it also spans a few mediums. It first hit the radio airwaves as a song in 1968 by Jeannie C. Riley. This country megahit was re-recorded by artists like Dolly Parton (1969), Billy Ray Cyrus (1996) and Martina McBride (2004). It’s a song about scandal, miniskirts and a really tough PTA! Not only did it make a good song, it made a good movie. In 1978 Barbara Eden (“I Dream of Jeannie”) starred in the motion picture version of “Harper Valley PTA.” (FYI, if you have 90 minutes, we found the entire movie on YouTube.) And it didn’t end there. The movie was spun off into a TV sitcom in 1981. So who thinks it’s time for a “Harper Valley PTA” reboot in 2018? Television has definitely embraced PTA throughout the years. There was “Everybody Loves Raymond” in the ‘90s when Debra decided to reveal her updated, edgier style at a PTA meeting. (Forward 1:00 into this clip for the funniest part.) In 1974, Carol Burnett channeled a diva-tempered PTA mom as she battled for a spot in the Annual PTA Show auditions. And then in 1957—before most of us were born—Uncle Bentley juggles a PTA meeting and a date with a Hollywood starlet in a “Bachelor Father.” (Skip to 12:00 to catch the PTA part!) Can you believe that reference is 60 years old? It’s been a real blast producing PTA in Pop Culture Week. We hope you enjoy all our finds and we encourage you to share your own using #PTAPop on social media. And while it’s fun to see PTA pop up in movies, music and television, it’s even more satisfying to know that it’s the good work PTAs around the world do that’s truly what puts us in the spotlight. 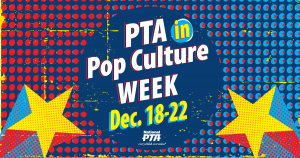 Enjoy PTA in Pop Culture Week and have a wonderful holiday season! Scott Meeks is the Communications Manager for National PTA. Parents, we know you’ll appreciate a real-life tale of math success—one of the many student victories that happen at Mathnasium every day! When Iris Kaganovich brought her fourth grade daughter Edden to Mathnasium of El Segundo, Calif. in September 2015, she was in panic mode. Like all Mathnasium students, Edden sat down for the Mathnasium diagnostic assessment, which pinpointed strengths and weaknesses in her math foundations. “I had no idea that Edden was struggling with basic multiplication, word problems and other fundamental math concepts,” Iris said. Edden diligently attended sessions two to three times a week. 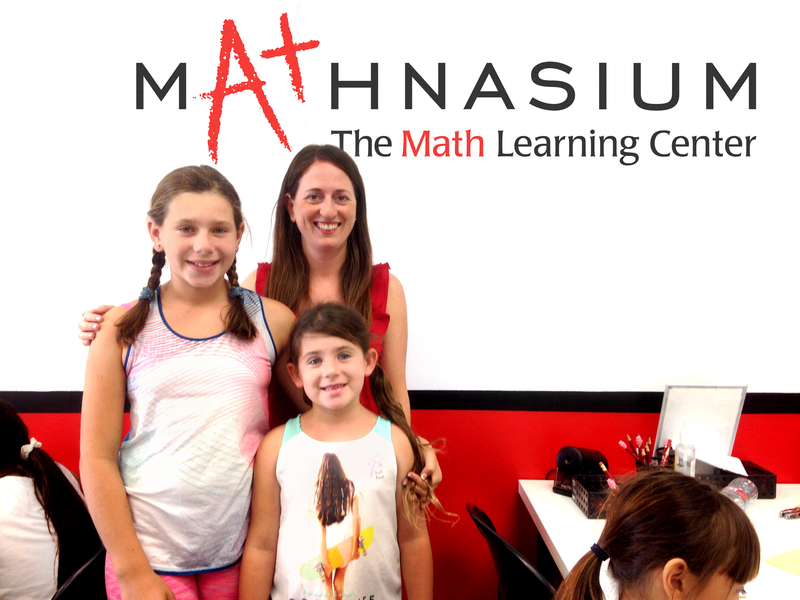 Both mother and daughter were won over by the friendly and productive learning environment and found the Mathnasium teaching method very efficient. Instructors spend one-on-one time with students like Edden and teach different approaches to explain challenging topics. As a working mom, Iris definitely appreciated Mathnasium’s flexible scheduling options as well. After two months, Iris began to see improvement. Remarkably, Edden’s newfound math success transformed homework time for the entire family! Now in fifth grade, Edden continues to go to Mathnasium. Gone are the days of floundering in the lowest-level math class—Iris happily reported that Edden almost got accepted into the highest-level class this school year! Inspired by Edden’s success, Iris decided to send her youngest child, first grader Sky, to Mathnasium, as well. Mathnasium is a proud sponsor of National PTA and has been invited to submit a blog post as part of their engagement with PTA. National PTA does not endorse any commercial entity, product or service, and no endorsement is implied by this content. Home from school with spare time, the summer offers many children the opportunity to watch more television. 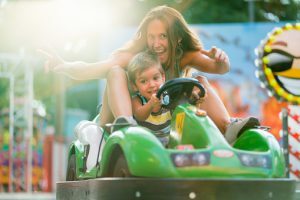 While each individual family has its own standards for deciding what’s appropriate for its children to watch, the TV Parental Guidelines is a helpful resource to help parents make informed decisions on which programs are suitable for their children. Since the late 1990s, virtually all programs that air on television—with the exception of news and sports—are assigned a rating that provides parents information about the content and age-appropriateness of the program. These ratings, called the TV Parental Guidelines, fall into two groups: ratings for programming created specifically for children and ratings for programming intended for general audiences. The TV Parental Guidelines are designed to be easily recognizable and simple to use. The Guidelines appear in the upper left corner of the TV screen in the first 15 seconds of the program and often reappear after commercial breaks. While most programs on television are rated, television commercials are not and cannot be blocked through parental controls. 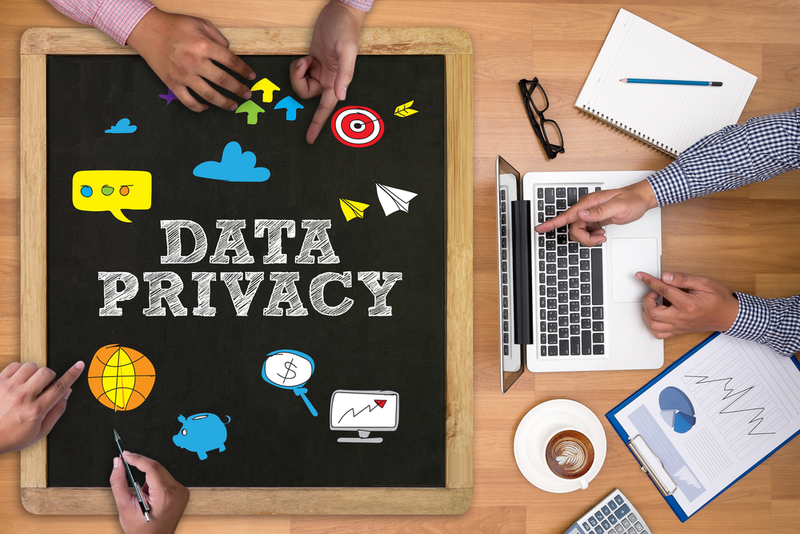 How Can the Guidelines be Used with Parental Controls? Families can use the TV Parental Guidelines simultaneously with parental controls in TV sets and cable and satellite set top boxes to block programs they believe are unsuitable for their children. 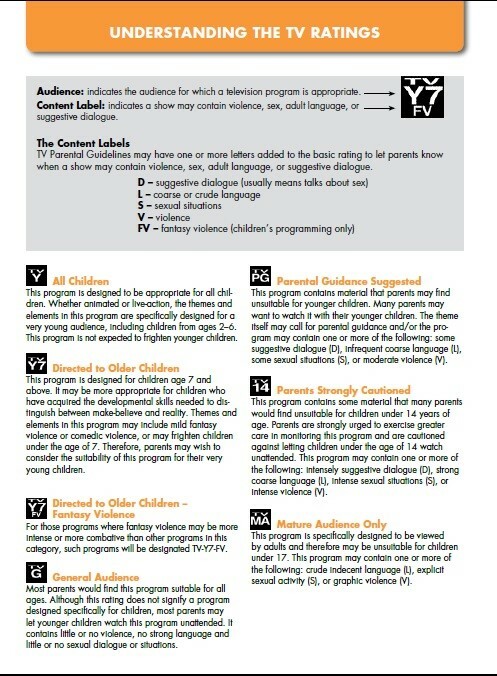 Parents have the ability to block programs based on both the age-based ratings as well as the content descriptors. The Monitoring Board is responsible for overseeing the TV Parental Guidelines and for working to ensure uniformity and consistency in the application of the guidelines. 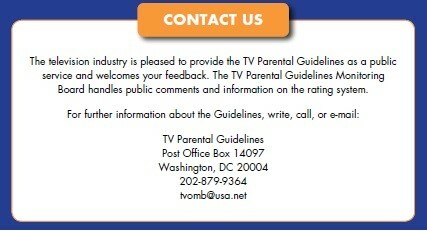 Parents can find more information about the ratings and the board at TVGuidelines.org. Viewers can also contact the board by mail, phone or email with any questions or complaints about TV ratings. Missi Tessier is the executive secretariat at the TV Parental Guidelines Monitoring Board. National PTA does not endorse any commercial entity, product or service, and no endorsement is implied by this content. It’s hard to believe that before long, it will be back-to-school time again. Like many of you, the U.S. Department of Agriculture (USDA) has been hard at work this summer preparing for the upcoming school year. Over the past six years since the passage of the Healthy, Hunger-Free Kids Act, a key component of First Lady Michelle Obama’s Let’s Move! initiative, schools across the country have made incredible progress in ensuring all children have access to more nutritious food in school. Today, joined by Kelly Langston, president of North Carolina PTA, USDA is announcing four final rules that continue the Obama Administration’s historic commitment to building a healthier next generation. While they won’t make any drastic new changes, these rules will ensure the positive changes schools have already made will remain in place and improve children’s health for years to come. National PTA has advocated for the National School Lunch and School Breakfast Programs since they were first created, and I am proud to have PTA join us for this announcement. You have been one of USDA’s most valued partners, advocating for changes like stronger nutrition standards and more family and community involvement in local school wellness policies to promote nutrition and physical activity in schools. 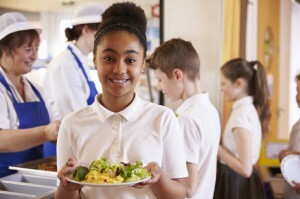 Thanks to your advocacy in Washington and your leadership in local school districts, 98% of schools nationwide are now meeting updated, science-based nutrition standards and serving meals with more fruits, vegetables, whole grains, and low-fat dairy—and less sodium—in age-appropriate portion sizes. USDA is also seeing healthier school environments overall for the more than 52 million children who attend schools that participate in the USDA meal programs. One of the biggest advances made under the Healthy, Hunger-Free Kids Act is the Smart Snacks in School rule, which ensured for the first time that all food and beverages sold a la carte in the cafeteria, in vending machines, or elsewhere on the school campus meet practical, science-based nutrition standards in-line with the requirements for school lunches and breakfasts. 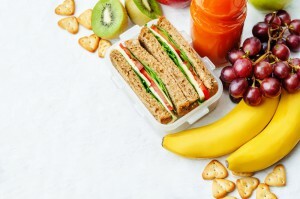 Schools have already implemented the Smart Snacks rule and are offering an impressive variety of options that meet the new standards and are popular with students. The Smart Snacks final rule USDA is announcing today will ensure this progress remains in place. About 70% of elementary and middle school students are exposed to some form of food or beverage marketing at school. The Local School Wellness Policy final rule, also announced today, ensures that any food or beverage marketed on school campuses during the school day meets the same Smart Snacks standards. National PTA has long been a strong supporter of robust school wellness policies that create healthy, supportive learning environments as children spend a majority of their day in school. National PTA was instrumental in developing this rule, which requires schools to engage parents, students, and community members in the creation of their local school wellness policies, and empowers communities to take an active role in the health of their children. States and local communities will continue to have flexibility in developing wellness policies that work best for them. The two other rules announced today, the Community Eligibility Provision final rule and the Administrative Review final rule, will codify changes that have improved access to school meals for low-income children and strengthened oversight and integrity in the programs at the State level. The Community Eligibility Provision, another major advance made under the Healthy, Hunger-Free Kids Act, allows school districts or individual schools with high numbers of low-income children to serve free meals to all students, eliminating the need for parents to fill out a free lunch application and reducing burdensome paperwork for school administrators so they can focus on what’s most important—feeding kids. More than 18,000 high-poverty schools serving 8.5 million students are now participating in this streamlined option, which has been shown to increase student participation in breakfast and lunch. When kids return to school and Congress returns to work in September, USDA and the Administration will continue to call on Congress to reauthorize the Federal child nutrition programs. The Senate Agriculture Committee has already passed a bi-partisan bill that would protect the progress we have made and earned PTA’s support. The Senate bill would also support grants and loans to help schools purchase the kitchen equipment and infrastructure they need to prepare healthy meals, which National PTA has called for. Children’s ability to learn in the classroom and reach their fullest potential depends on what we do right now to ensure their health. USDA is grateful for National PTA’s partnership in ensuring every child in America has the opportunity to grow up healthy and succeed in school and later in life. Together, we have supported these healthy changes that will benefit our children—and our country– far into the future. Tom Vilsack serves as the nation’s 30th Secretary of Agriculture.